A trip to the States is often a chance for British tourists to stock up on their favourite brands and special items that are not available on the UK side of the pond. Los Angeles is a fantastic destination for shopping, with a wealth of malls and promenades offering all kinds of merchandise. The sunny Californian climate also means most of these locations are outdoor centres, making them fantastic places to relax, hang out and eat, while you get your shopping done. We run down five of the best places to shop in Los Angeles, so if you’re planning a flight to LA, let us help with your schedule! 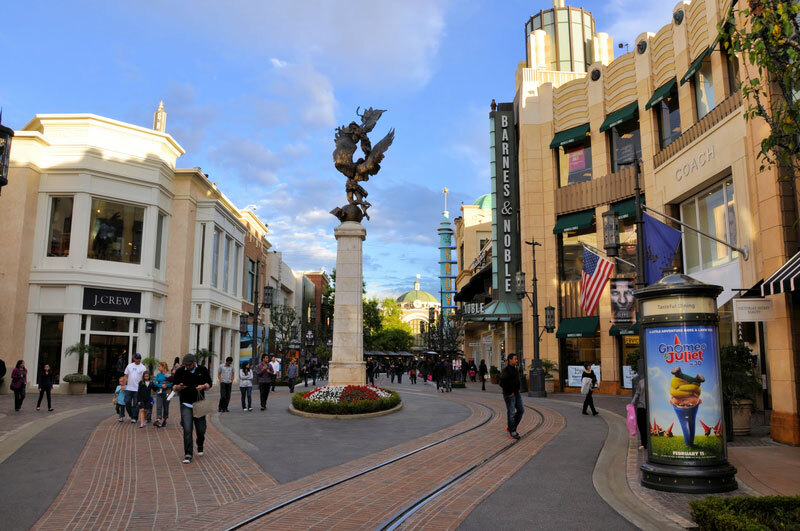 The Grove outdoor mall is not only a hot destination for shoppers, but for LA’s contingent of A-list celebrities. It’s not unusual to see TV and film stars shopping at The Grove, which is also used as a location for filming and for book signings. Shops include the department stores Nordstrom and Barneys New York, as well as an Apple store, J-Crew and MAC Cosmetics. Right next to The Grove is the historic LA ‘Farmers Market’, since opening in 1934 it has been an iconic landmark in the heart of the city. The proximity of the two locations means they are often discussed as one location, although they are actually separate entities. The farmers market offers different cuisines and produce from around the world packed into a maze of stalls and shops. The Beverly Center is a massive eight storey mall sandwiched between the West Hollywood and Beverly Hills parts of the City. Its flagship stores are two of the most well-known department stores in America – Macy’s and Bloomingdale’s, but it also features designer brand stores like Gucci, Fendi and Prada. In 2016, a massive $500million renovation began to modernise the mall (originally launched in the 1980s) as well as to add an upmarket food hall known as “The Street” and several new restaurant options. 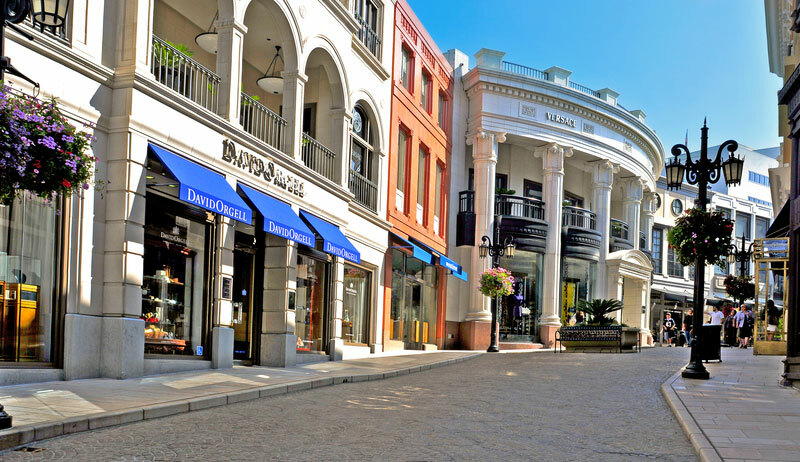 Just a couple of miles down the road from the Beverly Center is Rodeo Drive – a strip of stores, restaurants and hotels frequented by the wealthiest residents of Los Angeles and surrounding suburbs. Even if shopping at the some of the more expensive boutiques on Rodeo Drive is out of your budget, the street is a tourist attraction in its own right, both for the architecture and star-spotting. Santa Monica is a beautiful part of Los Angeles that is right by the ocean and encapsulates the Santa Monica Pier, the beach and block after block of shops, restaurants and theatres. It’s one of the more tourist heavy parts of the city, for obvious reasons, but is also a must-see part of Los Angeles. In particular, the third street promenade which is home to hundreds of stores catering to any and all needs. This pedestrianized part of the city (pedestrian spaces being somewhat rare in a city full of car lovers) is both beautiful and a great location for shoppers who want a range of artisan food and beverages and designer crafts and clothes. Americana is a stylish outdoor mall located in Glendale, in North Los Angeles. The central part of the mall features dancing fountains reminiscent of the Bellagio Hotel in Las Vegas (just on a much smaller scale…) as well as parades of high end stores like Calvin Klein, Diane von Furstenberg and Tiffany & Co.
A range of restaurants reside within to delight your taste buds, especially if you have a sweet tooth. These include Californian favourite Sprinkles Cupcakes, a Cheesecake Factory and Sugarfina – a luxury candy shop. An eighteen screen multiplex also offers the opportunity to check out Hollywood’s latest offerings. Located ten minutes south of Downtown Los Angeles, the Citadel Outlets Center is the only retail outlet center in the city. If you’re looking for premium brand names at bargain prices, Citadel is the place to go. It boasts over 130 different stores ranging from fashion to sportswear to home furnishings, as well as a range of restaurants and cafes. Fashion brands include Calvin Klein, Michael Kors, Levi’s, Armani and COACH, with athletic wear and running shoes available from Adidas, Nike and Under Armour. There also Le Creuset and Kitchen Collection stores if you fancy filling out your kitchen cupboards – just make sure your return luggage isn’t too heavy!